VinciWorks has released two new courses under the subject of Market Rules to help businesses train their staff and comply with complex competition law and market abuse rules. Coming against the backdrop of increasing enforcement action from the Competition and Markets Authority and the Financial Conduct Authority, VinciWorks’ new Market Rules courses will cover UK competition law and the European Union’s Market Abuse Regulations. Competition Law: Know Your Market drops users into a set of immersive scenarios to test their knowledge, understanding, and ability to comply with UK competition law. The course is broken into short modules that cover different aspects of UK competition law, including price-fixing, cartels and meetings with competitors. Each module contains simulations of real business dilemmas with key learning points related to the scenario. 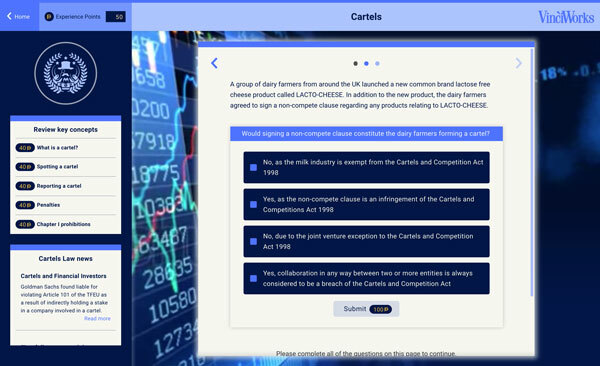 Each set of scenario questions is illustrated with real life examples and the latest news concerning enforcement action from the Competition and Markets Authority. Users come away with a comprehensive understanding of the UK Competition Act, the Enterprise Act, and how to apply their knowledge to everyday situations. Following in the same, immersive format, Market Abuse: Know Your Trade tests a user’s knowledge, understanding and ability to comply with the Market Abuse Regulations. With three compact modules covering the key parts of the EU regulations, including information sharing, market manipulation and fraud, the course also covers all the key aspects of the MAR regime required to ensure compliance. Realistic scenarios with interactive questions tests users’ ability to grasp the key principles of market abuse, and understand the rules around what can and cannot be discussed with competitors. This course can be translated into multiple foreign languages and is ready to be rolled out for staff working across the EU. VinciWorks has released a series of innovative, interactive courses based on the situated learning theory model. This type of training combines real world examples with the application of theoretical knowledge. This suite of points-based courses allows expert users to ‘test-out’, completing the course in a shorter amount of time if they can correctly apply their knowledge to the scenarios. If you would like to know more about our latest Market Rules training, feel free to reach out by completing the form below. This entry was posted in Course & product updates, Thought leadership on 23rd January 2019 by VinciWorks.